Multi use platform scales provide the exact function that their name suggests. They are functional for a wide variety of uses. As an example, in the medical community, they might be used to weigh patients in a standing position but also to weigh those who are confined to a chair. The multiple uses of this type of scale allows a business to purchase one scale and use it for many functions, thus reducing the amount of money that needs to be spent on equipment. A farmer might also have a multipurpose scale to weigh different types of livestock or different kinds of crops on the same platform scale. Any scale needs to be durable and able to last through heavy use. However, a multipurpose scale may receive even more abuse from different types of living or non-living things that are being weighed. When shopping for a platform scale, look for a solid and durable product that will last through weighing situations for a long time. Once again, these scales reduce costs for businesses because they reduce the amount of repairs or replacements that must be made. A scale can only be useful if it does what it is supposed to do at the time it is supposed to do it. Choose platform scales that are made from quality materials and crafted with superior techniques to ensure that the scales will be functional each time they are used. With normal use, these scales will remain functional for a long time, ensuring that any purchaser is able to get their money’s worth from this product. The high quality materials will easily stand up to the normal use that is associated with these types of scales. Depending on how a scale will be used, it may need to be moved occasionally or even frequently. As an example, if a farmer is using the scale to weigh livestock, it is easier to carry the scale to the livestock than to try to bring all of the livestock to the scale. When purchasing platform scales, look for scales that are designed in ways that make them easy to move. They should be made as lightweight as they can be and still remain sturdy enough to handle the normal usage of the job. So, when the job calls for frequent or occasional moving of the scale, make sure those scales will be easily moved. In years past, a scale was just a scale. Now, multi use platform scales are provided with many extra features. Some scales may be able to perform calculations related to the items that are being weighed. Some scales may allow remote access so that the user does not have to be near the scale to operate it. This can be especially helpful with weighing extremely large objects that might be in danger of falling onto the operator. This can also be useful when trying to weigh livestock that might pose some sort of threat. Consider multi use platform scales that are affordable. With the high quality materials, the added functions, the ease of use and many other features, one might believe that platform scales would have to be very expensive. However, this is not true. Platform scales can be designed to be extremely affordable in spite of all the features and benefits. Look for a company that does everything possible to ensure that costs are kept low so that the savings can be passed on to the customer. In today’s fast paced world, everything is connected. Data flies around the world at record speeds. Information is passed instantly. Complex calculations are generally performed by computers. Even record keeping is computerized, now. Some multi use scales are available in versions that allow USB or Ethernet data connections. Some scales will allow data to be passed to computers, instantly, performing calculations on the fly. Some scales may even accept data from the network connections, allowing the scales to interact with the computer program and the measurements that are being made. Network connections are an easy feature that is available for multipurpose scales. If this is an important function for your business, be sure the scale you purchase will allow this feature. With all of the computerized calculations and digital data storage, many people tend to forget about analog components. However, some businesses still have need for analog interactions in spite of the advancements in technology that allow digital connections. Many companies offer multipurpose scales that allow the user to interact with the scale in analog formats. 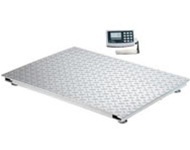 Multipurpose platform scales are used by many various industries and businesses. In the medical field, platform scales are used for many reasons. As mentioned earlier, some platform scales are adjustable to allow for patients to be weighed in or out of a chair. Even in homes, multipurpose scales may be required. Many homes use the same scale for weighing postage that they also use in the kitchen. In the agricultural arena, farmers may need to weigh different crops or animals. Depending on the sizes of each item, the same platform scale can be used to weigh each crop or each kind of animal, ensuring that less money is needed to be spent on extra equipment. What Type Of Customer Service Is Provided For Platform Scales? With many companies, the purchaser is on their own when they buy scales. Look for a company that will allow you to contact them to help you decide which type of scales will best fit your needs. A good company will help you analyze your current situation to see if a multipurpose scale is the best fit for your home or business. After the scale is purchased, customer service and support should not end. If there are problems with your new scale, you should be able to contact the company for help. While some scales can be used for multiple purposes, there are definitely reasons to buy more than one scale. Someone working in the agricultural industry cannot use the same scale to weigh mail for postage as the scale they use to weigh cows. Because there are different reasons for using scales, platform scales are available in various sizes. The amount of weight that a particular size scale will hold is also important, especially when dealing with larger items. With combinations of analog functions, digital functions and several other features, a scale could easily because almost impossible to operate. Platform scales should be easy to operate, ensuring that almost anyone can walk up to the scale and get to work. Of course some features may involve more complicated processes. Those processes will be detailed in the documentation for the scale. However, the basic processes are very simple and easy to operate. Before making any purchase of platform scales, stop to consider your needs. What size scale will you need? How much weight will the scale need to support? These questions will help you determine how large the scale will need to be. Find out about the company. Will the company offer support before, during and after the purchase process? You will feel more confident about your purchase if you know that expert help is available. Find out what others think about the company. Ask business associates if they have used the same company. If so, what sort of experience did they have? While one person’s bad experience could be due to a misunderstanding, several people who all report the same types of problems might be a clue that you should look elsewhere. When you are ready to purchase a multipurpose platform scale, turn to Arlyn Scales. Let them help you discover the best scale for your needs. Contact them today at http://www.arlynscales.com to find out how they can help you.